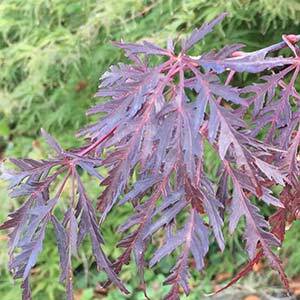 If you are looking for a Japanese Maple with dark foliage, Acer palmatum Dissectum Inaba Shidare is one of the best. Deep red to burgundy and finely dissected the foliage gives a lacy appearance. This is a very strong growing variety. Foliage is larger than many of the other dissected maples and it holds its colour well into autumn. With a good upright habit, the new stems are red and the branch structure is generally stronger than other Cut Leaf Maples. This is also a maple that can seems to handle hot sun a lot better than most others, it tends not to suffer leaf burn like other red varieties. With its very dark foliage this is a Japanese Maple that makes an excellent specimen tree in the garden. Best described as upright with a slight weeping habit. Plant it by itself as a feature tree, or use it amongst other shade plants such as Hydrangeas, Camellias and Rhododendrons. Excellent in containers where sit will grow for a number of years before needing repotting. For a year round effect, try underplanting with Liriope muscari ‘Emerald Cascade. The name of this maple does give away its growth habit, it has a natural cascading or weeping habit and ’Shidare’ does mean cascading. Best growing conditions are in a cool deep moist soil in a position sheltered from hot winds. After planting water in well and provide extra water through the first few summers and during dry spring periods. Like all Japanese Maples it is best to mulch around the plant after planting to help maintain a cool moist root run. Height – To around 2 metres in height. Height will vary depending on grafting by supplier. Spread – To around 2 meters. Growth – Rate Moderate depending on soil and climate. Foliage – Very deep red to burgundy, almost black in appearance. Turning to a crimson red in autumn. Position – Best in a position where it is protected from the hot afternoon sun from summer to autumn.